T. El-Ghazawi, O. Frieder, J. Gaber, S. Alaoui, “Biologically Inspired Solutions for Task Mapping,” in Biologically Inspired Solutions for Parallel Processing, edited by A. Zomaya, John Wiley &Sons Inc., New York, 2001. ISBN: 0-471- 35352-3. T. El-Ghazawi and G. Frieder, “Redundant Arrays of Inexpensive Disks (RAID),” in The Encyclopedia of Computer Science, edited by A. Ralston, E. Reilly, and D. Hemmendiger, Nature Publishing Group, London, 2000. ISBN: 0-333-77879-0. Miaoqing Huang, Kris Gaj, and Tarek El-Ghazawi, "New Hardware Architectures for Montgomery Modular Multiplication Algorithm," IEEE Transactions onComputers, vol. 60, no. 7, pp. 923-936, July 2011. M. Huang, V. K. Narayana, T. El-Ghazawi, M. Bakhouya and J. Gaber, “Efficient Mapping of Task Graphs onto Reconfigurable Hardware Using Architectural Variants,” IEEE Transactions on Computers (accepted with minor revision). M. Huang, V. Narayana, H. Simmler, O. Serres and T. El-Ghazawi: Communication and Reconfiguration-Aware Task Scheduling for High-Performance Reconfigurable Computing. ACM Transactions on Reconfigurable Technology and Systems (TRETS). Volume 3 Issue 4, November 2010. Miaoqing Huang, Olivier Serres, and Tarek El-Ghazawi, and Gregory Newby, "Parameterized Hardware Design on Reconfigurable Computers: An Image Processing Case Study," International Journal of Reconfigurable Computing, vol. 2010, pp. 1-11, April, 2010, doi:10.1155/2010/454506. A. Kayi, T. El-Ghazawi, and G. Newby: Performance Issues in Emerging Homogeneous Multicore Architectures. Advances in System Performance Modeling, Analysis, and Enhancement. Elsevier Journal: Simulation, Modeling Practice and Theory, Vol 17, Issue 9, pp 1485-1499, October 2009. A. Kayi, E. Kornkven, T. El-Ghazawi, S. Al-Bahra, and G. Newby: Performance Analysis and Tuning for Clusters with ccNUMA Nodes for Scientific Computing: A Case Study. International Journal of Computer Systems Science and Engineering, Vol 24, Issue 9, pp 1285-1499, September 2009. El-Araby, El-Ghazawi, LeMoigne, and Irish: Reconfigurable Processing for Satellite On-Board Automatic Cloud Cover Assessment (ACCA). Journal of Real-Time Image Processing. Springer. Vol4 No3, August 2009 ISSN 1861- 8200. Buell, El-Ghazawi, Gaj, and Kindratenko, High-Performance Reconfigurable Computing” IEEE Computer (Guest Editors Intro), March 2007 (Vol. 40, No. 3). El-Araby, E., Taher, M., Gaj, K., El-Ghazawi, T., Caliga, D. and Alexandridis, N. (2006) System-level parallelism and concurrency maximization in reconfigurable computing applications’, Int. J. Embedded Systems, Vol. 2, Nos. 1/2, pp.62–72. E. El-Araby, M. Taher, K. Gaj, T. El-Ghazawi, D. Caliga, N. Alexandridis, “System-Level Parallelism and Concurrency Maximization in Reconfigurable Computing Applications”, International Journal for Embedded Systems (IJES), to appear in Issue 2, 2006. H. Baala, O. Flauzac, J. Gaber, M. Bui, and T. El-Ghazawi, "A Self-Stabilizing Distributed Algorithm for Spanning Tree Construction in Wireless Ad-Hoc Networks,” Journal of Parallel and Distributed Computing (JPDC), Academic Press. 63(2003) 97-104. S. Alaoui, T. El-Ghazawi, O. Frieder, A. Bellaachia, and A. Bensaid, "Mapping Tasks onto Nodes: A Parallel Local Neighborhood Approach,” Future Generation Computer Systems, North-Holland Elsevier, vol. 17, pp. 397-403, 2001. T. El-Ghazawi and J. Le Moigne. "Mutiresolution Wavelet Decomposition on the MasPar Massively Parallel System," Journal of Computers and Their Applications, vol. 1, No. 1, Aug. 1994. T. El-Ghazawi and A. Youssef, "A General Framework for the Design of Adaptive Fault-Tolerant Routing Algorithms," IEEE Transactions on Reliability, vol. 42, No. 2, June 1993. T. El-Ghazawi and A. Youssef, "Fault-Tolerance in Product Networks," The International Journal of Mini and Microcomputers, vol. 15, No. 3, Nov. 1993. E. El-Araby, M. Taher, T. El-Ghazawi, A. Youssif, R. Irish, and J. Le Moigne, “Performance Scalability of a Remote Sensing Application on High Performance Reconfigurable Platforms”, NASA Earth-Sun System Technology Conference (ESTC 2006), Maryland, USA, June, 2006. E. El-Araby, M. Taher, T. El-Ghazawi, J.Le Moigne, "Prototyping Automatic Cloud Cover Assessment (ACCA) Algorithm for Remote Sensing On-Board Processing on a Reconfigurable Computer,"Proc. IEEE 2005 Conference on Field Programmable Technology, FPT'05, Singapore, Dec. 11-14, 2005. J. Harkins, E. El-Araby, M. Huang, T. El-Ghazawi, "Performance of Sorting Algorithms on a Reconfigurable Computer," Proc. IEEE 2005 Conference on Field Programmable Technology, FPT'05, Singapore, Dec. 11-14, 2005. E. El-Araby, K. Gaj, T. El-Ghazawi, "A System Level Design Methodology for Reconfigurable Computing Applications," Proc. IEEE 2005 Conference on Field Programmable Technology, FPT'05, Singapore, Dec. 11-14, 2005. C. Shu, K. Gaj, T. El-Ghazawi , "Low Latency Elliptic Curve Cryptography Accelerators for NIST Curves on Binary Fields," Proc. IEEE 2005 Conference on Field Programmable Technology, FPT'05, Singapore, Dec. 11-14, 2005. S. Bajracharya, D. Misra, K. Gaj, T. El-Ghazawi , "Reconfigurable Hardware Implementation of Mesh Routing in Number Field Sieve Factorization," Extended Abstract, Talk Special Purpose Hardware for Attacking Cryptographic Systems, SHARCS 2005, Paris, France, Feb. 24-25, 2005, pp. 71-81. E. El-Araby, T. El-Ghazawi, J.Le Moigne, and K. Gaj, "Wavelet Spectral Dimension Reduction of Hyperspectral Imagery on a Reconfigurable Computer," Proc. IEEE 2004 Conference on Field Programmable Technology, FPT 2004, Brisbane, Australia, Dec. 6-8, 2004, pp. 399-402. E. Chitalwala, T. El-Ghazawi, K. Gaj, N. Alexandridis, D. Poznanovic, "Effective System and Performance Benchmarking for Reconfigurable Computers," Proc. IEEE 2004 Conference on Field Programmable Technology, FPT 2004, Brisbane, Australia, Dec. 6-8, 2004, pp. 453-456. S. Bajracharya, C. Shu, K. Gaj, T. El-Ghazawi, "Implementation of Elliptic Curve Cryptosystems over GF(2^n) in Optimal Normal Basis on a Reconfigurable Computer," 14th International Conference on Field Programmable Logic and Applications, FPL 2004, Antwerp, Belgium, Aug 30 - Sept 1, 2004, pp. 1001-1005. N. Nguyen, K. Gaj, D. Caliga, T. El-Ghazawi, "Implementation of Elliptic Curve Cryptosystems on a Reconfigurable Computer," Proc. IEEE International Conference on Field-Programmable Technology, FPT 2003, Tokyo, Japan, Dec. 2003, pp. 60-67. E. El-Araby, M. Taher, K. Gaj, D. Caliga, T. El-Ghazawi, N. Alexandridis, "Exploiting System-level Parallelism in the Application Development on a Reconfigurable Computer," Proc. IEEE International Conference on Field-Programmable Technology, FPT 2003, Tokyo, Japan, Dec. 2003, pp. 443-446. A. Michalski, K. Gaj, T. El-Ghazawi, "An Implementation Comparison of an IDEA Encryption Cryptosystem on Two General-Purpose Reconfigurable Computers," LNCS 2778, 13th International Conference on Field Programmable Logic and Applications, FPL 2003, Lisbon, Portugal, Sep. 2003, pp. 204-219. O. D. Fidanci, D. Poznanovic, K. Gaj, T. El-Ghazawi, and N. Alexandridis, "Performance and Overhead in a Hybrid Reconfigurable Computer," Reconfigurable Architecture Workshop, RAW 2003, Nice, France, Apr. 2003. T. El-Ghazawi and F. Cantonnet, "UPC Performance and Potential: A NPB Experimental Study," Supercomputing’02, IEEE CS, Baltimore, Nov. 16-22, 2002. J. Le Moigne, A. Cole-Rhodes, R. Eastman, T.El-Ghazawi, K. Johnson, S. Kaewpijit, N. Laporte, J. Morisette, N. S. Netanyahu, H. S. Stone, and I. Zavorin, “Multiple Sensor Image Registration, Image Fusion, and Dimension Reduction of Earth Science Imgery," ISIF/IEEE FUSION'02, Annapolis, July 7-11, 2002. S. Kaewpijit, J. Le Moigne, and T. El-Ghazawi, “A Wavelet-based PCA Reduction for Hyperspectral Imagery," IEEE International Geoscience and Remote Sensing Symposium (IEEE IGARSS’02), Toronto, Canada, June 24-28, 2002. K. Gaj, T. El-Ghazawi, F. Vroman, N. Nguyen, J. R. Radzikowski, P. Samipagdi, and S. A. Suboh, "Performance Evaluation of Selected Job Management Systems," Proceedings of IEEE International Parallel and Distributed Processing Symposium (PMEO-PDS'02), Fort Lauderdale, Florida, Apr. 15-19, 2002. T. El-Ghazawi, S. Kaewpijit, and J. Le Moigne, "Parallel Adaptive Reduction of Hyperspectral Data to its Intrinsic Dimensionality," Third IEEE International Conference on Cluster Computing (Cluster'01), Newport Beach, California, Oct. 8-11, 2001. T. El-Ghazawi and S. Chauvin, “UPC Benchmarking Issues,” International Conference on Parallel Processing (ICPP’01), IEEE CS Press, Valencia, Spain, Sep. 3-7, 2001. S. Kaewpijit, J. Le Moigne, and T. El-Ghazawi, "A Hybrid Algorithm for Automatic Detection of Hyperspectral Dimensionality, " IEEE International Geoscience and Remote Sensing Symposium (IEEE IGARSS’01), Sydney, Australia, July 9-13, 2001. J. Vongsaard, L. S. Chiu, T. El-Ghazawi, M. Kafatos, and R. Yang, "The Continuous Tracking of Reflectivity Data from Multi-platform Observation Using Genetic Algorithm," IEEE International Geoscience and Remote Sensing Symposium (IEEE IGARSS’01), Sydney, Australia, July 9-13, 2001. T. Gharib and T. El-Ghazawi, “A Low Overhead parallel Clustering Algorithm," International Conference on Parallel and Distributed Techniques and Applications (PDPTA), Las Vegas, June 2001. N. Goharian, T. El-Ghazawi, and D. Grossman, “ Enterprise Text Processing: A Sparse Matrix Approach,” IEEE International Conference on Information Technology: Coding and Computing (ITCC 2001), Las Vegas, Apr. 2001. K.Gaber, J.Bahi and T.El-Ghazawi, "Parallel Mining of Association Rules with a Hopfield Type Neural Network," The Twelfths IEEE International Conference on Tools with Artificial Intelligence (ICTAI-2000), Vancouver, British Columbia, Canada, Nov. 13-15, 2000. N. Goharian, Tarek El-Ghazawi, David Grossman, and Abdur Chowdhury, “On the Enhancements of a Sparse Matrix Information Retrieval Approach. International Conference on Parallel and Distributed Techniques and Applications,” Las Vegas, June 26-29, 2000. Tarek El-Ghazawi, Chris Lynnes, Ming Zhu, and Marc Brown, “Science Processing of MODIS Earth Observing Data with a Parallel Cluster,” International Conference on Parallel and Distributed Techniques and Applications, Las Vegas, June 26-29, 2000. P. Charlemwat and T. El-Ghazawi, “Multiresolution Image Registration Using Genetics,” IEEE International Conference on Image Processing, Kobe, Japan, Oct. 1999. R. Yang, C. Wang, M. Kafatos, X.S. Wang, and T. El-Ghazawi, “Remote Data Access via the SIESIP Distributed Information System,” 11th Scientific and Statistical Database Management (SSDBM’99), IEEE CS, Cleveland, July 1999. J. Faik, M. Jiber, A. Bellaachia, and T. El-Ghazawi, “Optimum Expansion Embedding of Binary Trees in the X-mesh,” International Conference on Parallel and Distributed Processing Techniques and Applications (PDPTA'99), Las Vegas, June 1999. N. Goharian, T. El-Ghazawi, and D. Grossman, “On the Implementation of Information Retrieval as Sparse Matrix Application,” International Conference on Parallel and Distributed Processing Techniques and Applications (PDPTA'99), Las Vegas, June 1999. P. Chalermwat, T. El-Ghazawi, and J. LeMoigne, "GA-based Image Registration on Parallel Clusters," Lecture Notes in Computer Science, Springe-Verlag. IEEE Workshop on Biologically Inspired Solutions to Parallel Processing, San Juan, Apr. 1999. S. M. Alaoui, O. Frieder, T. El-Ghazawi, "A Parallel Genetic Algorithm for Task Mapping on Parallel Machines," Lecture Notes in Computer Science, Springer-Verlag. IEEE Workshop on Biologically Inspired Solutions to Parallel Processing, San Juan, Apr. 1999. J. Le Moigne, W. Xia, P. Chalermwat, T. El-Ghazawi, M. Mareboyan, N. Netanyahu, J. Tilton, W. Campbell, R. Cromp, “First Evaluation of Automatic Registration Methods,” IEEE International Geoscience and Remote Sensing Symposium (IEEE IGARSS’98), Seattle, July 1998. M. Kafatos, D. Ziskin, S. Wang, R. Yang, K. Li, T. El-Ghazawi, and H. Wolf. “The Seasonal To Interannual Earth Science Information Partner System,” IEEE International Geoscience and Remote Sensing Symposium (IEEE IGARSS’98), Seattle, July 1998. T. El-Ghazawi, P. Chalermwat, P. Pisama-Nga, A. Ozkaya, N. Speciale, and D. Wilson, “PACET: A PC-Parallel Architecture for Cost-Efficient Telemetry,” IEEE Aeorospace’98, Aspen, Mar. 1998. T. El-Ghazawi, P. Chalermwat, and J. Le Moigne. "Wavelet-Based Image Registration on Parallel Computers," Supercomputing’97, IEEE CS, San Jose, Nov. 1997. S. Nastea, T. El-Ghazawi, O. Frieder, "Performance Optimization of Combined Variable-Cost Computations and I/O,” Lecture Notes in Computer Science, Springer-Verlag. Proceedings of the 4th International Symposium on Solving Irregularly Structured Problems in Parallel (IRREGULAR-97), Paderborn, Germany, June 1997. A. Meajil, T. El-Ghazawi, and T. Sterling, “An Architecture-Independent Workload Characterization Model for Parallel Computer Architectures,” Proceedings of the Aizu International Symposium on Parallel Algorithms and Architecture Synthesis (PAS-97), Aizu, Japan, IEEE Computer Society Press, Mar. 1997. S. Nastea, T. El-Ghazawi, and O. Frieder, “A Statistically-Based Multi-Algorithmic Approach for Parallel Sparse Matrix Computations,” Proceedings of IEEE Symposium on the Frontiers of Massively Parallel Computations (Frontiers’96), Annapolis, MD., Oct. 1996. S. Nastea, O. Frieder, and T. El-Ghazawi, “Load-Balancing in Sparse Matrix-Vector Multiplication,” Eight IEEE Symposium on Parallel and Distributed Processing, 1996. T. El-Ghazawi and J. Le Moigne, “Wavelet Decomposition on High-Performance Computing Systems,” Proceedings of the 25th International Conference on Parallel Processing (ICPP’96), IEEE CS Press, Bloomingdale, IL., Aug. 1996. A. Meajil, T. El-Ghazawi, and T. Sterling, “A Quantitative Approach for Architecture-Invariant Workload Characterization,” Lecture Notes in Computer Science, Springer-Verlag. 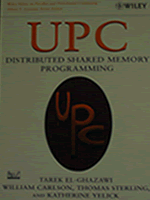 Proceedings of PARA’96, Applied Parallel Computing, Copenhagen, Aug. 1996. M. Berry and T. El-Ghazawi, “An Experimental Study of Input/Output Characteristics of NASA Earth and Space Sciences Applications,” Proceedings of IEEE International Parallel Processing Symposium (IPPS’96), Honolulu, Apr. 1996. S. Nastea, T. El-Ghazawi, and O. Frieder, “Parallel Input/Output Impact on Sparse Matrix Compression,” Proceedings of the Data Compression Conference (DCC’96), IEEE CS, Snowbird, Apr. 1996. T. El-Ghazawi, "Characteristics of the MasPar Parallel I/O System," Proceedings of Frontiers'95, IEEE CS, McLean, VA., Feb. 1995. A. Chan, C. Chui, J. LeMoigne, H. Lee, J. Liu, and T. El-Ghazawi, "The Performance Impact of Data Placement for Wavelet Decomposition of Two Dimensional Image Data on SIMD Machines," Proceedings of Frontiers'95, IEEE CS, McLean, Feb. 1995. M. Baig, N. Alexandridis, and T. El-Ghazawi, "Single Processor-Pool MSIMD/MIMD Architectures," Proceedings of the Fourth IEEE Symposium on Parallel and Distributed Processing, Arlington, TX., Dec. 1992. T. El-Ghazawi and A. Youssef, "A Unified Approach to Adaptive Fault-Tolerant Routing," Proceedings of the IEEE 12th International Conference on Distributed Computing Systems, Yokohama, Japan, June 1992. M. Baig, T. El-Ghazawi, and N. Alexandridis, "Mixed-Mode Multicomputers with Load Adaptability," Lecture Notes in Computer Science, Berlin: Springer-Verlag. Proceedings of the Parallel Architecture and Languages "Parle 92", Paris, June 1992. M. Taher, K. Gaj, T. El-Ghazawi, and N. Alexandridis, "Job Management System Extension to Support SLAAC-1V Reconfigurable Hardware," 2002 MAPLD International Conference, Laurel, MD., Sep. 10-12, 2002. O. D. Fidanci, H. Diab, T. El-Ghazawi, and N. Alexandridis, "Implementation Trade-offs of Triple-DES in the SRC Reconfigurable Computing Environment," 2002 MAPLD International Conference, Laurel, MD., Sep. 10-12, 2002. F. Salem, M. Kafatos, and T. El-Ghazawi, “Hyperspectral Image Analysis for Oil Spill Detection on Contaminated Land of Urban Areas,” 3rd International Symposium Remote Sensing of Urban Areas, Istanbul, Turkey, 11-13 June 2002. J. Vongsaard, L. S. Chiu, T. El-Ghazawi, J. Weinman, M. Kafatos, and R. Yang, “Automatic Morphing Using Image Registration: Application to Continuous Tracking of Rain Fields,” American Meteorological Society (AMS), Mississippi River Climate and Hydrology, New Orleans, Louisiana, May 13-17, 2002. L. Chiu, T. El-Ghazawi, J. Weinman, J. Vongsaard, R. Yang, and M. Kafatos, “Automatic Tracking Of Remote Sensing Precipitation Data Using Automatic Morphing: September 1999 Hurricane Floyd Case Study,” European Geophysical Society (EGS’02) XXVII General Assembly, Nice, France, Apr. 21-28, 2002. S. Kaewpijit, J. Le Moigne, and T. El-Ghazawi, "Spectral Data Reduction Via Wavelet Decomposition," SPIE's OE/Aerospace Sensing, Wavelet Applications IX, Orlando, Apr. 2002. J. Vongsaard, L. S. Chiu, T. El-Ghazawi, J. Weinman, M. Kafatos, and R. Yang, "The Comparison of the Continuous Tracking of Rain Rate and Reflectivity Data Using Genetic Based Wavelet Image Registration Technique," 3rd Plinius Conference on Mediterranean Storms (EGS’01), Baja Sardinia, Italy, Oct. 1-3, 2001. F. Salem, M. Kafatos, T. El-Ghazawi, T. Gomez, and R. Yang, “Hyperspectral Image Analysis for Oil Spill Detection,” 22nd Asian Conference on Remote Sensing (ACRS’01) Singapore, 5 - 9 Nov. 2001. A. V. Staicu, J. R. Radzikowski, K Gaj, N. Alexandridis, and T. El-Ghazawi, "Effective Use of Networked Reconfigurable Resources," Proc. 2001 MAPLD Int. Conf., Laurel, MD., Sep. 2001. S. Kaewpijit, J. Le Moigne, and T. El-Ghazawi, "Finding the Dimensionality of Hyperspectral Data," 2001 SPIE's OE/Aerospace Sensing, Algorithms for Multispectral and Hyperspectral Data VII, Orlando, Apr. 16-20, 2001. F. Salem, T. El-Ghazawi, and M. Kafatos, “Remote Sensing and Image Analysis for Oil Spill Mitigation in the Red Sea,” International Conference on Earth Observations and Global Information, Cairo, Egypt, Nov. 11-14, 2000. Christopher Lynnes, Peter Smith, Larry Shotland, Tarek El-Ghazawi, Ming Zhu, “Level 1 Processing of MODIS Direct Broadcast Data,” The 4th International Meeting on Direct Broadcast of Earth Observation Data, Dundee, Scotland, June 27-30, 2000. J.Gaber, J.Bahi, T.El-Ghazawi and B.Toursel, "Analysis of Randomized on-line load distribution in static network," International Conference on Software Engineering Applied to Networking & Parallel/ Distributed Computing (SNPD'2000), Champagne-Ardenne, France, May 18-21, 2000. M. Kafatos, R. Yang, L. Chiu, T. El-Ghazawi, Z. Li, J. McManus, C. Wang, X. S. Wang, H. Weir, and K-S Yang, “Data Access, Querying, and Analysis in a Distributed Data Information Framework Supporting Earth System Science. International Conference on Information Systems Analysis and Synthesis (SCI/ISAS’99 Multiconference), Orlando, July 1999. J. Le Moigne, W. Xia, S. Chettri, T. El-Ghazawi, ... et. al, “Towards an Intercomparison of Automated Registration Algorithms for Multiple Source Remote Sensing Data,” Image Registration Workshop (IRW’97), Greenbelt, MD., Nov. 1997. P. Chalermwat, T. El-Ghazawi, and J. Le Moigne, “Image Registration by Parts,” Image Registration Workshop (IRW’97), Greenbelt, MD., Nov. 1997. W. Xia, J. Le Moigne, J. Tilton, B.-T. Lerner, E. Kaymaz, J. Pierce, S. Raghavan, S. Chettri, T. El-Ghazawi, M. Mareboyana, N. Netanyahu, and W. J. Campbell, and R. F. Cromp, “A Registration Toolbox for Multi-Source Remote Sensing Applications,” Earth Observations and Environmental Information (EOEI’97), Alexandria, Egypt, Oct. 1997. A. Meajil and T. El-Ghazawi, "A Framework for Performance Prediction of Parallel Systems Based on Workload Similarity," The Eighth SIAM Conference on Parallel Processing for Scientific Computing, PP '97, Minneapolis, MN., Mar. 14-17, 1997. A. Ozkaya and T. El-Ghazawi, “An Electrostatic Particle_In_Cell (PIC) Simulations on the Intel Paragon,” Proceedings of the Parallel and Distributed Computing and Systems, Orlando, Sep. 1995. T. El-Ghazawi, J. Pritchard, and G. Knoble, "Applications of Massively Parallel Computing in Telemetry Processing," Proceedings of SPACEOPS'94, NASA and CCSDS, Greenbelt, MD, Nov. 1994. T. El-Ghazawi, "Performance Evaluation of Early Systems: An HPCC Perspective," Proceedings of the Sixth SIAM Conference on Parallel Processing for Scientific Computing, Norfolk, VA., Mar. 1993. M. Baig, N. Alexandridis, and T. El-Ghazawi, "Cost and Performance Analysis of Partitionable SIMD/MIMD Architectures," Proceedings of the ISMM International Conference on Computer Applications in Design, Simulation, and Analysis, Orlando, FL., Mar. 1992. M. Baig, T. El-Ghazawi, and N. Alexandridis, "A Highly Reconfigurable MSIMD/MIMD Architecture," Proceedings of the Fourth ISMM International Conference on Parallel and Distributed Computing and Systems, Washington D.C., vol. II, Oct. 1991. T. El-Ghazawi and G. Flachs, "Design of Pipelined Processors for Optimal Implementation of Difference Equations," Proceedings of the Fourth ISMM International Conference on Parallel and Distributed Computing and Systems, Washington D.C., Vol. II, Oct. 1991. A. Youssef and T. El-Ghazawi, "Fault Tolerant Routing in Product Networks," Proceedings of the Fourth ISMM International Conference on Parallel and Distributed Computing and Systems, Washington D.C., Vol. II, Oct. 1991. W. E. Thompson, G. M. Flachs, L. Kazda, V. Kittur, and T. El-Ghazawi, “Vision System Control,” Proceedings of 19TH Pittsburgh Conference on Modeling and Simulation, Pittsburgh, PA., May 1988. S. Schleusener, T. El-Ghazawi, R. Black, and R. Blanco, “Analysis of Scanning Recognition Systems Using Windowed Clutter Measurements,” Proceedings of the 29th Midwest Symposium on Circuits and Systems, Lincoln, Nebraska, Aug. 1986. S. Schleusener, T. El-Ghazawi, R. Black, and R. Blanco, “Analog Windowed Clutter Instrumentation,” Proceedings of ISE/IEEE Ideas in Science and Electronics, Albuquerque, New Mexico, May 1986. T. El-Ghazawi and M. D. Merril, "An Analytical Design of Digital Controllers with Minimum Settling Time," Proceedings of the 28th Midwest Symposium on Circuits and systems, Louisville, Kentucky, Aug. 1985. 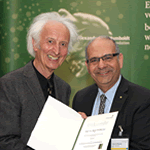 Professor El-Ghazawi receives the Humboldt Research Award from the Humboldt Foundation President in Bamberg, Germany. Photo is provided as a courtesy of the Humboldt Foundation. With German Federal President Mr. Joachim Gauck at the Bellevue Palace, Berlin, June 2015. Professor El-Ghazawi receives the SEAS Distinguished Researcher Award.